As nations seek to strengthen their health systems, they are increasingly looking to primary health care (PHC) to provide a clear and comprehensive sense of direction. The World Health Report 2008 analyzes how primary health care reforms, that embody the principles of universal access, equity and social justice, are an essential response to the health challenges of a rapidly changing world and the growing expectations of countries and their citizens for health and health care. 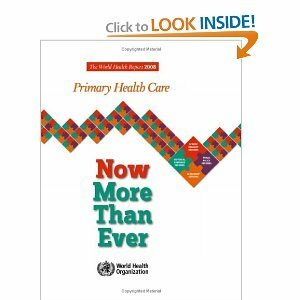 The Report identifies four interlocking sets of PHC reforms that aim to: achieve universal access and social protection, so as to improve health equity; re-organize service delivery around people’s needs an expectations; secure healthier communities through better public policies; and remodel leadership for health around more effective government and the active participation of key stakeholders. By capitalizing on this momentum, investment in primary health care reforms can transform health systems and improve the health of individuals, families and communities everywhere. For everyone interested in how progress in health can be made in the 21st century, The World Health Report 2008 is indispensable reading.